The tragic mistreatment by a charlatan masquerading as a doctor blinded Fanny shortly after birth. Nevertheless, she learned to function as a sighted child except for her inability to read. She was an extraordinary child filled with joy and mischief! At her grandmother's knee, she began to demonstrate an exceptional memory, and memorized several complete books of the Bible, including Ruth and Proverbs. She left home at age 15 to begin her formal education. One of the most notable pupils of the New York Institute for Special Education, Fanny was also the first woman to address the US Congress. Fulfilling the roles of wife, mother, friend, teacher, nurse to the sick during the cholera epidemic, humanitarian to the poor and disenfranchised, and friend of presidents — Fanny Crosby was an exceptional woman by any standard. And her legacy lives on through the thousands of hymns that are still sung today. 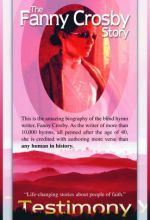 This biography of the blind hymn writer, Fanny Crosby (1820-1915), is a blend of movie portrayal and commentary. She wrote more than 10,000 Christian hymns, memorized several books of the Bible, taught English and history at the New York Institute for Special Education, nursed the sick during a cholera epidemic, helped the poor, and refused to see her blindness as a handicap. Crosby is featured in non-tradition female roles. Viewers learn not only about her life, but also about the treatment of the blind in the late 19th and early 20th centuries and the role of sacred song. Her positive approach to life offers an excellent example for young people. This production gives viewers a more thorough understanding of her life than Fanny Crosby the Hymnwriter by Bernard Ruffin (Barbour, 1996) because it provides more of her quotes and hymns. Public libraries offering biographies about influential Americans and teachers looking for a documentary that allows interdisciplinary sharing between history and music or poetry classes will find this a helpful resource. Author, humanitarian, and the first woman to speak before Congress, Frances "Fanny" Crosby (1820-1915) wrote more religious hymns than anyone else in history (with some estimates topping 10,000, all of which were penned after she turned 40). Part of the Testimony biography series, which presents "life changing stories about people of faith," The Fanny Crosby Story chronicles Crosby's inspirational life, from her childhood blindness after being stricken with an eye infection, through her years as a tireless advocate for the poor and sick, and her later career as an amazing prodigious hymnist (she is best known for "Safe in the Arms of Jesus"). Although not well-known today, Crosby was a well-recognized and admired person in her day. DVD extras include a director's commentary track and outtakes, Recommended. Designed to run as a one-hour TV special, this documentary features a narrator, interviews with a biographer of Crosby, a university music historian, and a collage of black and white photos of Crosby at various ages. Interspersed are short vignettes of actors playing the parts of Fanny, her parents, her school friends and headmaster, and her husband; but usually they have little or no spoken words, only a voice-over by the narrator. As an infant Crosby was blinded by a charlatan posing as a physician. This resulted in the development of an astounding memory. As a child she could recite whole books of the Bible her grandmother had read to her. Later she was hired as a teacher at the school for the blind where she graduated. She became a poet and was so popular that her friends included President Polk and General Zachary Scott. She was the first female to speak before the full Congress. After age 43 she penned lyrics of more than 10,000 hymns, sometimes writing under as many as 250 pen names. After she heard the music to "Blessed Assurance" she wrote all the lyrics for it in only 5 minutes. Married for 44 years, Fanny and her husband's only child died as an infant. She lived to be in her 90's and dictated letters and poems even on the day of her death. Although this DVD does not have the flash and media effects seen on The History Channel, it's an accurate, interesting, and concise documentary of an amazing Christian. Here's a great visual biography of a truly notable Christian and hymn writer, Fanny Crosby. Fanny was blind from infancy, but she overcame her impairment with the Lord's grace, and we are rich for it – we still sing many of the thousands of hymns that she wrote, songs like "To God Be the Glory," "Praise Him! Praise Him!" "Tell Me the Story of Jesus," "Near the Cross," "I Am Thine, O Lord," "Blessed Assurance," and "Redeemed." Although the Presbyterian's 1955 Hymnbook saw fit to include five of Fanny Crosby's hymns, the somewhat snooty editors of their 1990 Presbyterian Hymnal deigned to include but two, "Blessed Assurance" and "To God Be the Glory." The 1989 edition of The United Methodist Hymnal includes seven, and if you pursue an evangelical church hymnal, no doubt many more will be found of the some 10,000 she supposedly wrote during her long and productive life. This fascinating film does a fine job in dramatizing and analyzing the life of this amazing woman, especially given that it is only 46 minutes long. Beginning with her blindness caused by an incompetent quack when she was a small child, the film alternates between well-acted dramatic scenes and comments by various musical experts. Raised to be independent, she spent much time outdoors where she developed her love for nature. At 15 she left home to enroll in the only school in America devoted to educating the blind and handicapped, the New York Institute for Special Education. A brilliant student with a talent for poetry – William Cullen Bryant had praised her early work – she became a teacher at her alma mater, leaving only when she married a fellow blind teacher. Later she became the first woman to speak before the U.S. Congress, her eloquent plea on behalf of the handicapped touching many a heart, it was reported. She moved among the higher echelons of society meeting many U.S. Presidents and among the poor, whom she aided in many ways. It was not until she was forty that Fanny Crosby (she retained her maiden name when she wrote) added to her list of careers – teacher, nurse, advocate for the poor – that of hymn writer. Under contract to a publisher, she wrote so many hymns and poetry that she assumed dozens upon dozens of pen names. Not even Watts or Charles Wesley equaled her incredible record (most of which garnered her no more than a couple of dollars each). It is true that the quality was not always the highest, but she wrote so many good ones that have become better enshrined in the hearts of the faithful that this does not really matter. Otto Schlatter - A Must See! We rented this from the Library and are debating purchase so we can have a copy. It is a very spiritually uplifting account of her life and the movie is done very well. I was on the edge of my seat most of the 46 minutes wanting to know more. le agradesco al seor por permitir a personas asi a trabajar en su obra tgraendo almas acristo por medio de la buena musica cristiana. Nicely done although there is hardly any singing. As with many of these VisionVideos, you almost have to already know the story from books. The movies are just to see it on screen, not really to educate with much substance. You can't show it to friends and expect them to learn much. Budgets probably make so many of these Vision Videos too condensed. You can easily imagine this style of Fanny Crosby acting done as a simple stage play by a church group. Blessed Assurance is sung very very slowly and dragging certainly not with the verve that makes it so popular. Unfortunately, hardly any singing in the whole movie. A good movie worth watching more than once and therefore worth it if you have bought it. This version was made in 2003. I thought I was buying the much older movie which I do hope to find again some day.